HÀ NỘI – 15-year-old Vietnamese International Master (IM) Nguyễn Anh Khôi aims to become an International Grandmaster (IGM) next year. Khôi spoke at the award ceremony held by the Việt Nam Chess Federation (VCF) on November 9 for his achievements in winning two gold medals at the boys’ U16 blitz and rapid event of the World Youth U14, U16 and U18 Rapid and Blitz Chess Championships, which ended in Greece in October. This was Việt Nam’s best result at the world competition’s U16 event. Khôi was also world U10 and U12 standard chess champion in 2012 and 2014. 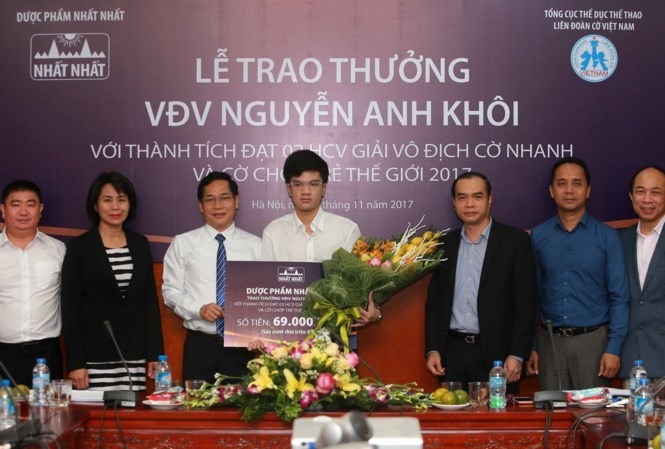 Nhất Nhất Pharmacy Group presented Khôi VNĐ69million (US$3,000) for his world victory at the ceremony. The young master also receives a $66,000 sponsorship from the group for his training and competitions until 2018.